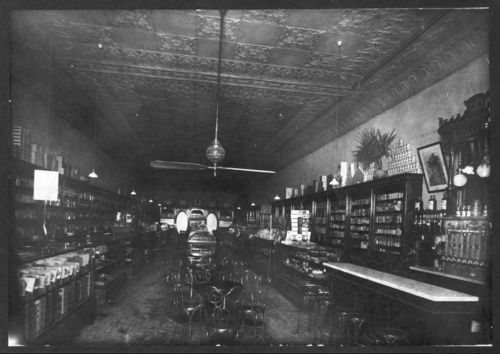 This photograph shows an interior view of Sorgatz Drugstore in Concordia, Kansas. Items in display cases are visible along both sides of the store, and tables and chairs are visible in the middle. There appears to be a soda fountain behind the service counter and stools in the right foreground. The store was owned by Francis F. Sorgatz, whose biographical sketch appears in William E. Connelley's History of Kansas State and People (1928). Holding Institution: Donateb by Cloud County Historical Society, 1979.